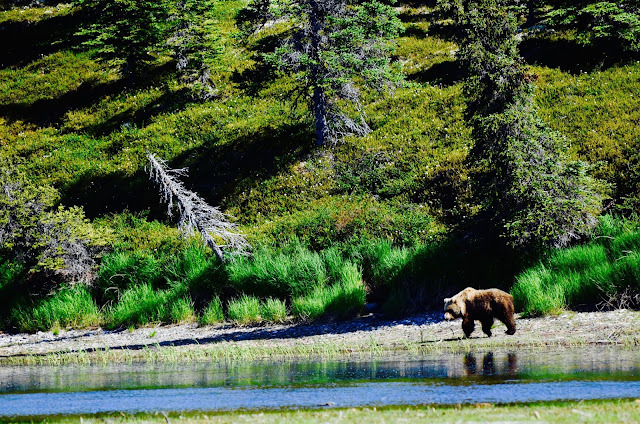 Tenkara Tracks: Tenkara Bricolage: Trade Shows, New Guide Trips, Alaska, and More! It's been a winter, spring, and early summer of planning, guiding, traveling, and most recently...fishing! 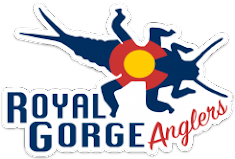 In early January I worked Royal Gorge Anglers' booth at the Denver Fly Fishing Show, and despite nursing what I think was a herniated disc in my lower back (nearly 40 years of backpacking), I had a really great time. Thanks goes out to all of of my former and current clients, fly shop customers, and friends who stopped by the booth to talk tenkara! It's always fun to see familiar faces come through the doors at this show. I continue to be honored to represent RGA as their tenkara guide and backcountry specialist, and I'm really looking forward to the coming season as we offer all of my existing guide trips, plus some new ones that will really break new ground as far as guided tenkara trips are concerned. On the heels of the Denver Fly Fishing Show was the International Sportsmen's Expo, also in Denver, the second weekend in January. This time I represented Zen Tenkara at our booth at the expo. I was amazed at the interest in Zen rods and the rest of our products! Zen owner, Karin Miller, conducted multiple presentations on all things tenkara, and our proximity to the casting pool made it possible to show a lot of folks what a Zen tenkara rod can do. Many thanks to everyone who stopped by the booth to say "hi" and take a look at what Zen can offer! A special treat at the booth was reuniting with my childhood sweetie, Pattie. We hadn't seen each other for well over 40 years, and it was great to see Pattie (who I long ago nicknamed "Peppermint Pattie") and her husband, Craig. Back in the summer of 2006 I spent a week guiding California's champion elk caller extroidinaire, Greg Hubbell, onto bighorn sheep in central Colorado, just prior to his once-in-a-lifetime Colorado bighorn sheep hunt. After over a decade, it was fun to have Greg stop by the booth just before he competed in the Rocky Mountain Elk Foundation's elk calling contest! One of the highlights of the weekend was a visit from the star of Dual Survival, and owner of Self Reliance Outfitters and the Pathfinder School, Dave Canterbury. Dave and I share a keen interest in the simplicity, affordability, and usefulness of tenkara as it applies to bushcraft, and he and I had a long talk on all of those topics. Working the trade show circuit with Zen Tenkara owner, Karin Miller. After 40+ years...Peppermint Pattie and I! A surprise visit from my good friend, and renowned champion elk caller, Greg Hubbell. Dave Canterbury and I, after a good discussion of all things bushcraft (including tenkara). Regarding guided tenkara trips...I have a few new ones that are worth mentioning. In all of these, our goal at RGA is to offer unique trips in diverse landscapes, with a focus on quality...quality guiding and instruction, quality cuisine, quality attention to detail. 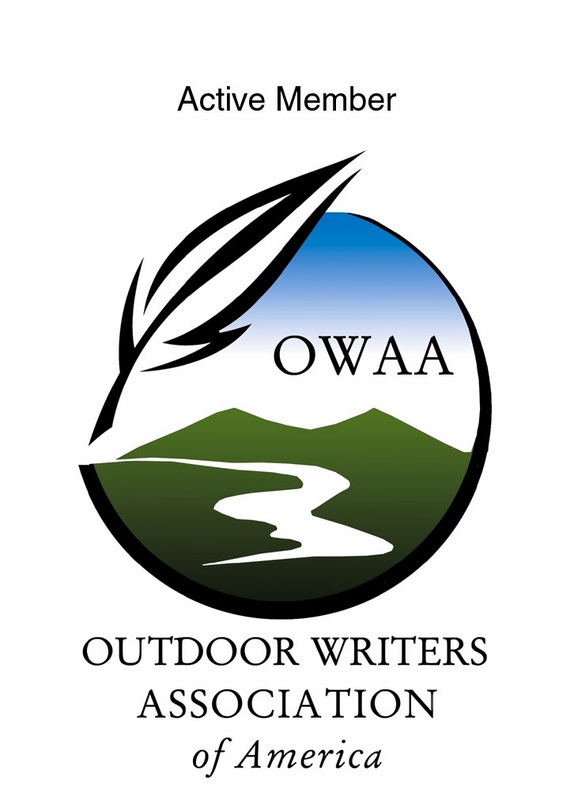 For my second season with RGA (and sixth season guiding), I continue to offer half-day and full-day guided backcountry tenkara trips. These aren't the usual along-the-highway walk-wade trips. For my off-the-grid trips, we typically drive to a trailhead, hike a mile or more down into deep canyons to the creek, and fish our way several miles into them. Everything we need for the day we carry in on our backs...there's no walking back to the truck for reinforcements! These trips are really the essence of my work as a guide...I love doing them, and I love sharing the experience! Guiding a tenkara trip for Royal Gorge Anglers, deep in the canyons. I've been working on developing a new overnight wilderness backpack tenkara trip for Royal Gorge Anglers, and aside from a few formalities with the powers that be, it'll be a reality very soon. This trip will be highly participatory on the part of the client. We'll both carry equal loads in backpacks and share the camp chores. Exposure to backpack fly fishing and instruction in backcountry living is a big part of this trip! If hiking with a full pack, overnighting at a backcountry camp, and fishing gold medal water that's only accessible by foot is your thing, then this trip is tailor made for you! Stay tuned in the next couple of months for a formal announcement! Our overnight trips will utilize bombproof Kifaru shelters. Pulled beef casserole. Backcountry dining at its best! On the river just below camp. A nice brown trout, caught with tenkara, just downstream from our basecamp. Spring on the Arkansas River in Bighorn Sheep Canyon, and in the small, hidden canyons of Southern Colorado, was fantastic! We had a solid stonefly molt back in late February and into mid-March, followed by increasing blue-winged olive and then caddis activity. I had some spring guide trips on the Ark, and the riverside willows were literally packed with caddis! It only got better as water temps increased, days got warmer, and Mother's Day came and went. I've always said April, May, September and October are my favorite months to fish and guide on the Ark and in my canyons. 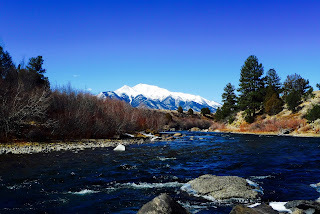 The other months are great too, but there's just something about cold mornings, warm afternoons, flurries of caddis and blue-winged olives, and the certain way the shadows are still a little low on the water no matter the time of day. It's satisfying to know that these magical times on the Ark are almost exactly five months apart, nearly to the day. Spring fishing on the Ark with a happy client! Right on the heels of the Mother's Day caddis hatch here at home, and after a couple of months of organizing, I hosted a trip to Intricate Bay Lodge, on southwest Alaska's enormous Lake Iliamna in early June. 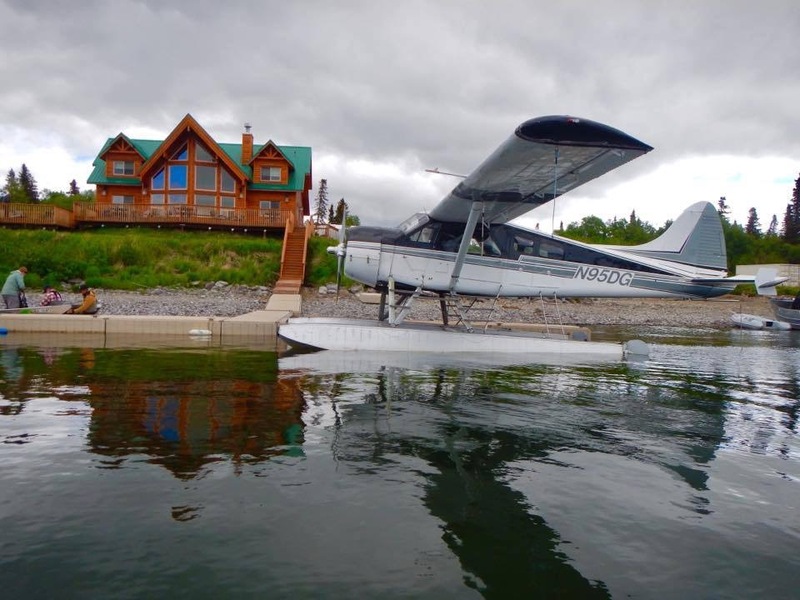 This trip was offered by Royal Gorge Anglers, and our destination was Intricate Bay Lodge, owned and operated by Brian Harry and staffed by some of the most capable lodge staff and Alaskan guides I've ever seen. 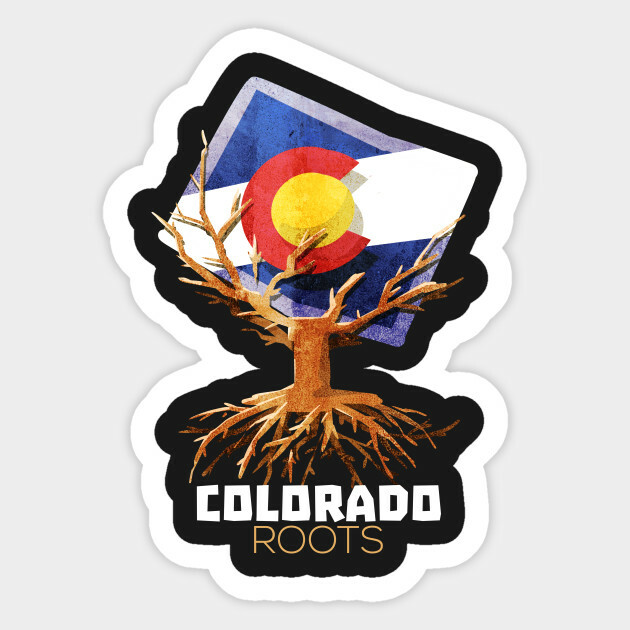 I had invited several former clients, who now had become close friends, as well as two more gentlemen from the Denver area. I'm currently writing a more detailed article on the trip, so stay tuned for more info! All I'll say for now is that tenkara is totally doable on the rivers and creeks in the Bristol Bay region, and if you really want to push the envelope for what fixed-line fly fishing is capable of, this is the place! 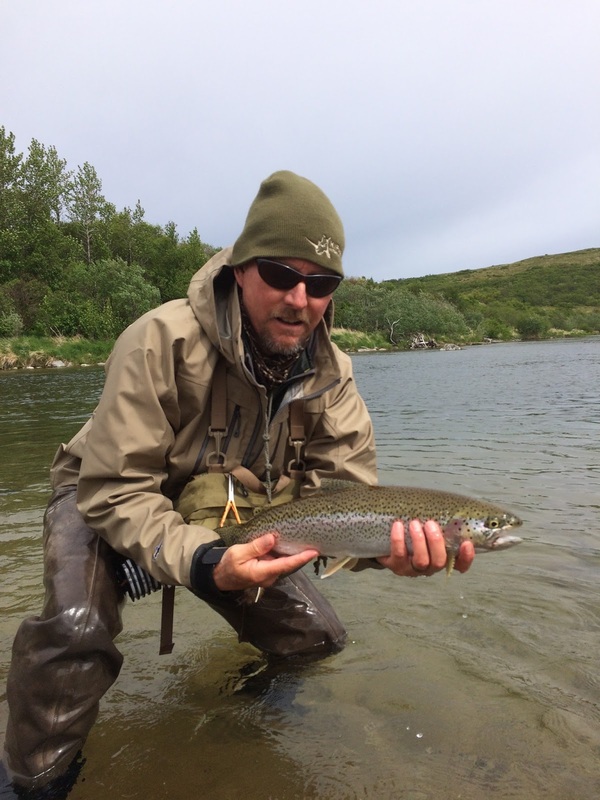 Big rainbows, big grayling, plentiful Dolly Varden, wildlife, stunning landscape. It's all there. More to follow! One of the neighbors, stopping by for a visit! One of many big rainbows caught on the Copper River with the strong, balanced, and refined Zen Tenkara Sagi!